We know there’s a lot to keep up with in regardds to the Nexus One so we’ve tasked ourselves with compiling all the known and rumored information.Â Below, you’ll find all the latest gossip and leaks.Â Until we hear officially, all of this is subject to change!Â For what it’s worth, all the initial rumors are panning out so keep your fingers crossed! An event has been scheduled for January 5th, with invitations being sent out to members of the press.Â Â Google is hosting the Android event at the Googleplex at 9:30AM PST. Internal T-Mobile screen shots indicate a Google-sold device with T-Mobile support. The hardware specs indicate a very powerful device with plenty of memory to go around. Rumored price puts the phone at $180 with 2-yr contract and $530 outright. Around the middle of October a writer for TheStreet.com was the first to really get the Google Phone rumors rolling again.Â He claimed that Google would be selling a handset directly, bypassing carriers. Google had a meeting on Friday and handed handsets out to everyone.Â Twitter helps break the news. Nothing has been officially announced.Â The closest we have so far is a post from the Google Mobile Blog that says their employees are dogfooding a mobile lab. Said handsets are unlocked and feature new mobile features and capabilities. 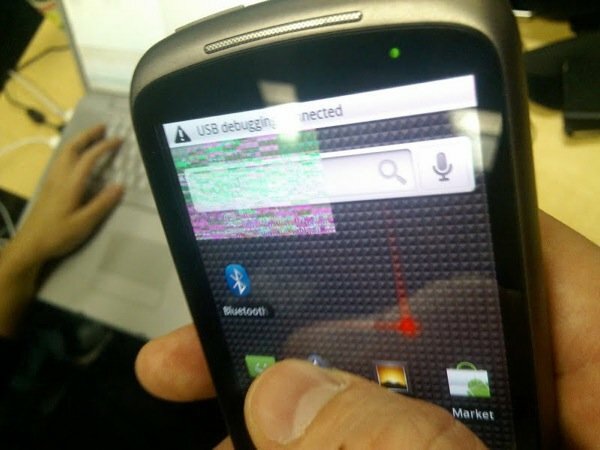 The Wall Street Journal publishes an article that pretty much confirms the rumors.Â The code name ‘Nexus One” is born. A few pictures have identified the handset as “Phone 88”.Â Perhaps each phone has a unique model/serial written into it to identify leaks.Â Looking back at the first Dragon/Passion images, we were told that the image blacked out parts of the screen becauseÂ “…it has a number that Iâ€™m told is used to determine who this phone was loaned to.“Â Coincidence?Â Maybe. The phone looks exactly like the HTC Dragon/Passion except for the missing HTC branding.Â Specs include a Snapdragon 1GHz chip, 3.7-inch AMOLED display, and a 5 megapixel camera. Gizmodo’s source from a few weeks back said that we have yet to see the ‘real’ Android.Â Based on collected descriptions, the ‘real’ Android might be one designed by Google which has every screen, button, and animated background specifically designed. According to a quick start that comes with the handsets, there is mention of a page for questions at google.com/phone/support. The site is inactive at this time. The phone has been cleared through the FCC with AT&T and T-Mobile bands. Google applied for the trademark to Nexus One on December 10th.Â Why patent an experimental handset that’s designed to stay internal? Will this be directly sold through Google? It appears so. Will “real” Android run as WiFi/VoIP? Will Google Voice be integrated? What do other members of the Open Handset Alliance think of this?Â Did they even know about it?Â What will their reaction be? This may have all started back in March when Google decided to open up shop in Taiwan.Â Working with HTC would be considerably easier if you were in their own back yard. Why would a carrier like T-Mobile even want to get involved with Google over this?Â It’s simple – their no contract plans are perfect for people who buy them.Â T-Mobile never loses a penny in having to subsidize the handset.Â And maybe more importantly, they know how big this could be for them.Â Why not be the carrier that embraces the move? We’re going to keep this post at the top of the site for a while as answers and rumors hit the net.Â If you know of any answers or have any insight, please let us know. See something incorrect or missing?Â Drop us a line. In terms of the wireless industry, this could be a big of a game changer as any.Â Buckle Up!